Giovanni Paglioli took this image on June 8, 2004 from Centro Astronomico Neil Armstrong in Salerno, Italy. The transit, or passage, of Venus across the face of the Sun is one of nature’s rarest celestial phenomena. Sunday's "ring of fire" solar eclipse may be history, but skywatchers have another stunning event to look forward to — next month's historic Venus transit of the sun. On Sunday (May 20), the moon covered most of the sun's disk but left a ring of light blazing around its circumference. The resulting annular solar eclipse wowed skywatchers in parts of Asia, the Pacific region and western North America. As impressive as that sight was, it may just be a warm-up for the Venus transit of the sun on June 5 (June 6 in much of the Eastern Hemisphere). Venus will cross the sun's face from Earth's perspective, appearing in silhouette as a tiny, slow-moving black dot. "I think this is the last one I'll see," Dean Pesnell, of NASA's Goddard Space Flight Center in Greenbelt, Md., told SPACE.com. Pesnell is project scientist for NASA's sun-watching Solar Dynamics Observatory (SDO) spacecraft, which will have an unparalleled view of the transit. 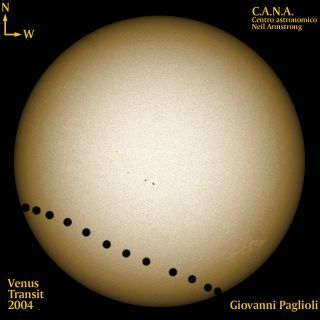 Venus transits occur in pairs that are eight years apart, but these dual events take place less than once per century. The last transit occurred in 2004, but the next won't come until 2117. In addition to being rare and spectacular skywatching events, transits of Venus have played a large role in astronomical history. For example, scientists and explorers mounted huge expeditions to view the 18th century's two transits, which occurred in 1761 and 1769. The goal was to answer one of astronomy's most important questions — the distance from Earth to the sun. By precisely timing the transit's length from many different points around the globe, the reasoning went, scientists could calculate the Earth-sun distance using the principles of parallax. With this information in hand, the scale of the entire solar system would follow. Famed British explorer Captain James Cook took part in the 1769 expedition, sailing to Tahiti and watching the transit from a place now known as Point Venus. The 18th-century efforts came up short, but astronomers eventually got the data they needed from photographs taken during the next pair of Venus transits, which occurred in 1874 and 1882. While most of the globe will able to watch at least part of the Venus transit on June 5-6, you may have to travel if you want to see Venus both enter and exit the solar disk. Weather permitting, the entire seven-hour transit will be widely visible from eastern Asia, eastern Australia, New Zealand and the western Pacific, as well as Alaska, northern Canada and almost all of Greenland. Not content to live vicariously through their spacecraft, Pesnell and some other SDO scientists will watch the transit from Fairbanks, Alaska. They're going to bring 10 to 20 educational displays with them, using the event to teach the public about the sun and SDO, Pesnell said. If you plan to watch the transit, be safe. WARNING: Never look at the sun directly with your naked eye or through cameras, binoculars or small telescopes without proper filters. Doing so can result in serious and permanent eye damage, including blindness. To safely observe the Venus transit, you can buy special solar filters to fit over your equipment, or No. 14 welder's glass to wear over your eyes. The safest and simplest technique, however, is to observe the transit indirectly using the solar projection method. Use your telescope or one side of your binoculars to project a magnified image of the sun’s disk onto a shaded white piece of cardboard. The projected image on the cardboard will be safe to look at and photograph. But be sure to cover the telescope’s finder scope or the unused half of the binoculars, and don’t let anyone look through them. If you take any great photos of the Venus transit and would like them to be considered for use in a story or image gallery, send them to SPACE.com Managing Editor Tariq Malik at tmalik@space.com.